Television is an incredible communications medium. In just an hour or so each day, with the flick of a button, I can glean bits of information about many topics of interest. Occasionally, I'll experience moments of sheer joy that surround viewing a good comedy act, a fine food show or a vintage movie. For the most part I'm drawn in by pure curiosity, often accompanied by mild shock about the images conveyed by many of the popular shows. While TV's detractors would say that we have become "zombies" as a result of its overuse, I, for one, am glad to have such an interesting and provocative plethora of mind numbing information at my fingertips. So what does this have to do with an article for a martial arts newsletter? Much of this broken stream of electronic consciousness rushes by at light speed. Occasionally, I can take away something of lasting value; a moment in time that may change my point of view or add an outlook that beforehand had not been considered. Such was the case as I found myself drawn in by the images contained in a show called "Shocking Moments (caught on tape)". It was not the first time that I've become enthralled by acts of violence on the screen. Here, in the US, we have such a penchant for the darkness of humanity that the airwaves are congested by such images. If there is not a sports match involving violence available, there is always the real thing, recorded for posterity by security cameras or home video. In the case of "Shocking Moments", there were a number of recorded incidents during which the victimized turned on the assailant, thwarting their attempts at robbery or other crimes of a personal nature. These were incidents involving acts of pure "self defense" on the part of the victims or passersby; there were no trained martial artists present, just ordinary people doing everyday things. In the episode that caught my eye, there was a robbery that took place in a large hardware store. In broad daylight, with customers milling about, a hooded man walked through the cashier's line and demanded money from the teller, at gunpoint. 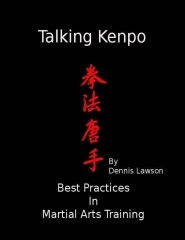 What took place next, in my view, was a page straight from the book of Kenpo's "Cycles of Consideration"1. The "cycle" is a tool that many Kenpoists are familiar with; some use it to physically train or conceptualize training exercises, while others may find that it is an integrated pattern of logical processes that can be easily used to solve any problem in life. Below is a graphic version of that same process. It is important to note that one may travel in either direction throughout the cycle ... moving forward when tactics succeed and backing up when they do not. We are in a hardware store. There are three aisles at the checkout. Our robber takes the middle aisle or #2. He is facing aisle #1, which is empty; the teller faces him. There are a couple of patrons and store employees at register #3, behind the gunman. We have just described the environment, over which we have limited control, as we begin to move into the DSA (Dimensional Stages of Action). Everyone involved now has a part in this action. The gunman and cashier (victim) are in the contact penetration or contact manipulation stages; most everyone else is out of contact until they decide to act. Attitude will determine what follows. The attitude of the bystanders appears to be that of shock, as everyone freezes for a moment. The attitude of the cashier is fearful (as it should be); the attitude of the gunman is aggressive, so much so that he is now in a state of "tunnel vision", thinking only of the acquisition of funds, at any cost. He controls the DSA because of the deadly weapon in his hand...or does he? There are other factors in the cycle, such as position, maneuver and angle; often the combination of a number of considerations will overcome the reliance on only one. In this case the gunman only controlled one factor of the DSA: his choice of a deadly weapon. During the time of his attack, he faced the teller while wearing a hooded jacket. With his peripheral vision obscured (by the hood) he had no idea what was taking place behind him. While others stood by, frozen with fear, the store owner stationed himself out of the gunman's line of sight in aisle # 3 (maneuver to position). Picking up an ordinary 3' - 4' carpenters level that lay on the counter (weapon at hand) he quickly struck with a downward 45 degree motion (angle of attack) that pinpointed the robbers' mastoid, sending him immediately, unconscious, to the floor. Unwittingly, the store owner had traveled through the cycle, arriving at a point of departure (for the assailant) as he now struck with his weapon at the point of contact penetration. From that point on, law enforcement stepped in. It struck me that this was an excellent example of the functional value found in the Cycle of Considerations. First, I would point out that attitude is everything. The store owner was clearly outraged that this individual would threaten his employee, his patrons and his livelihood. He acted accordingly; employing some very quick thinking; he took a weapon at hand and used it to his advantage. His position dictated that he had a fair chance of a positive outcome. His choices were a successful combination, not merely a singular action. When we look at the cycle as a tool for living, the terms may be loosely applied but still effective. We are all faced with tough choices in life; by taking the time to apply some rational concepts to otherwise difficult, emotional situations we might benefit in ways that transcend ordinary perception. As an exercise, try taking the "cycle" and apply it to a current problem in your life. Perhaps you will find it necessary to substitute terms, as we don't encourage pulling a weapon to solve every problem. Nonetheless, by looking at one's problem from a rational vantage point, backing up to the last stage of action before our situation went awry, we can often make successful choices before any more damage is done.